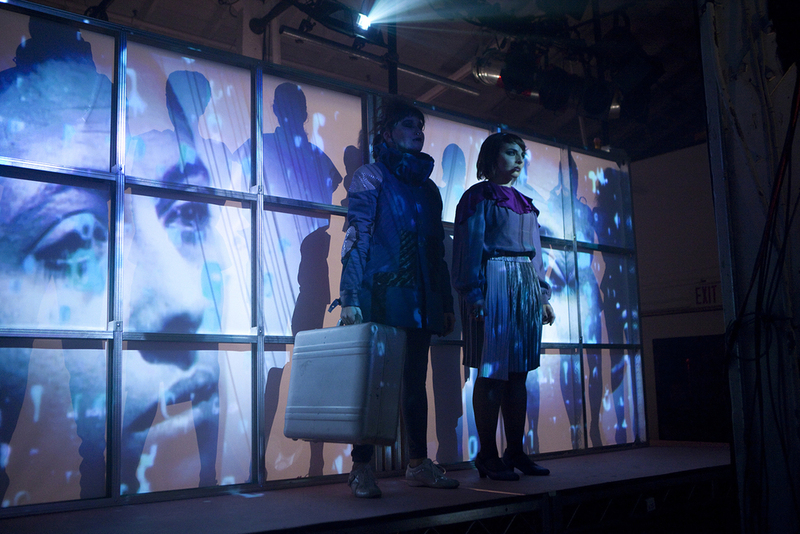 "The venerable performance space has been reconfigured into a new arrangement with a cool thrust stage designed by Lianne Arnold"
"This will be one of the most exhilarating eviscerations in L.A. this year. Don't miss it." A PoP! Musical EVENT! A Religious Revival?? An E! True Hollywood Fashion Tragedy mined from the redemptive, sorted, exploited, and mythic histories of Patty Duke and Patty Hearst!!! 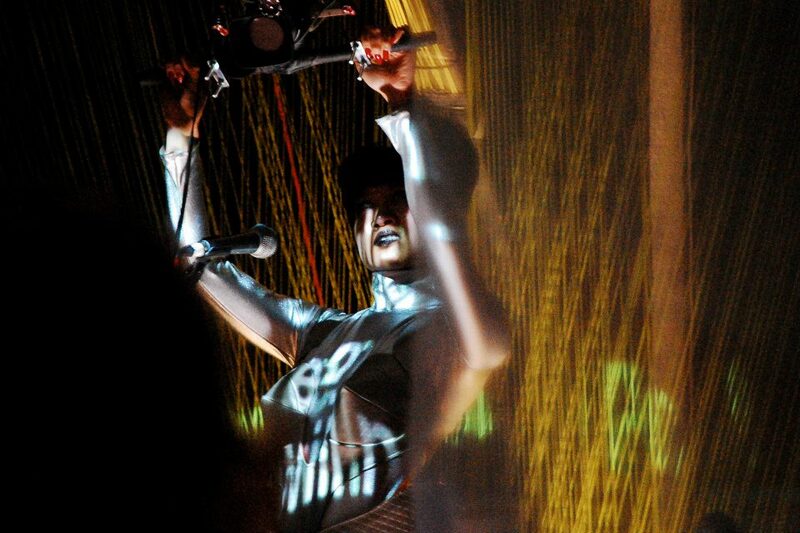 PATTY is a one-of-a-kind 360 experience that encompasses a live, outer-disciplinary performance (equal parts dance pop concert, fashion show and new media installation), an original album, an online interface, and clothing line. 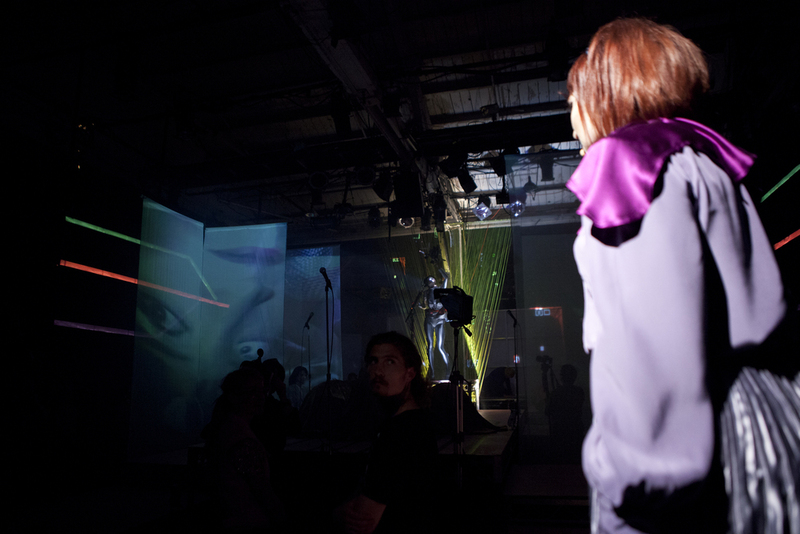 With the freedom to venture completely in and around the geography of the “stage”, or even go outside to the bar if the mood strikes, the audience is given permission to engage with The Revival as performance beyond a standard theatrical context and each audience member has a very unique physical point of view. Patty: The Revival **A PoP! Musical EVENT! ** acts more like a concert or fashion show than musical theater, right down to the tech booth sitting in a pit surrounded by the stage. Opposite the tech pit is an audience pit surrounded on 4 sides by performance platforms and caddy corner are audience spaces surrounded on 3 sides by stage. 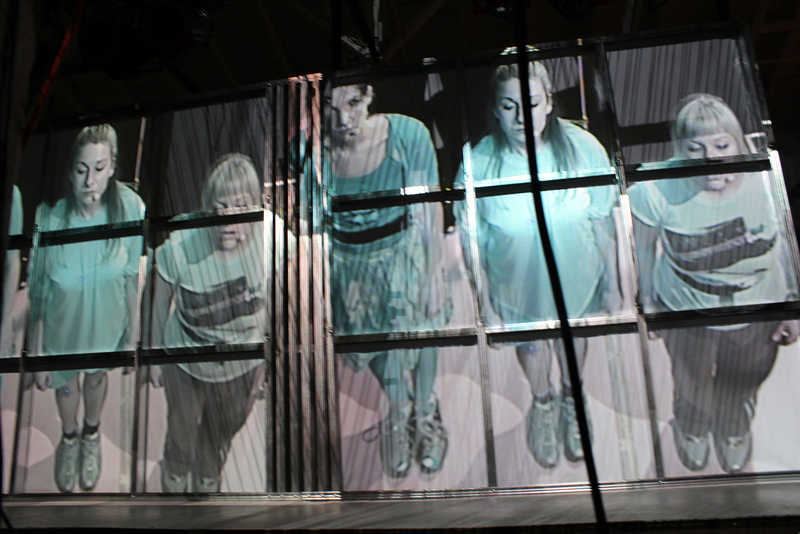 As both the set designer an co-video designer, I took the opportunity to play with the alternative projection textures and special configurations. Since the audience had freedom to move around, Patrick and I were less concerned with providing unobstructed views or adhering to the social contract of performer’s obligations to audience by re-designing the physicality of the space into a structure that serves the camera first. The content of the show is about voyeurism and celebrity and Woman. 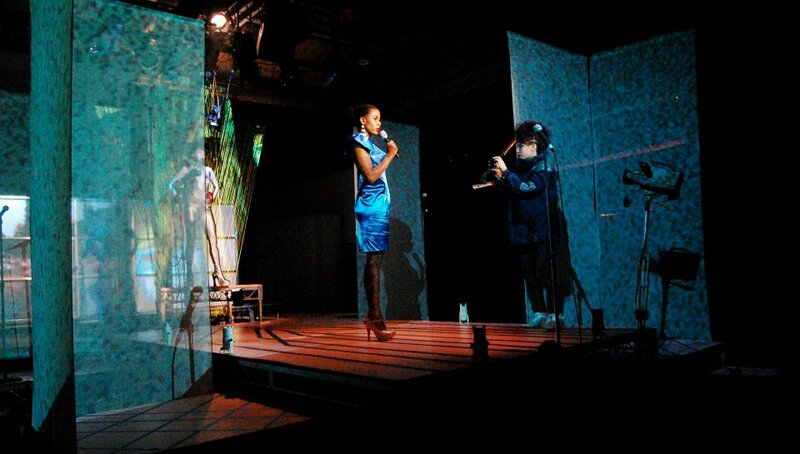 Wall to wall video content comprised a mix of pre-rendered and multi-camera live feed setup. The cameras represented a history of image capture from the past 40 years in physical presence, image quality and use. 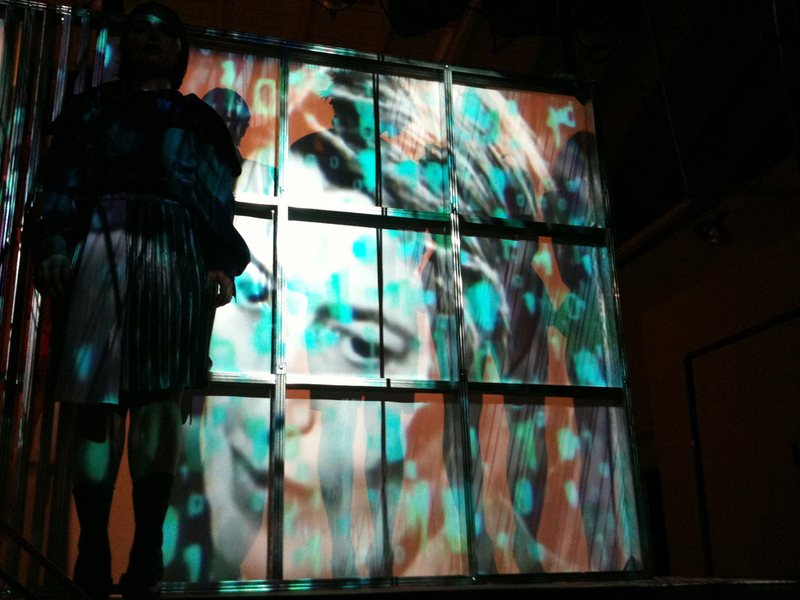 The cameras included a VHS cam grabbing image from a low, front angle, a security cam hiding high in the grid hitting from a rear angle pointing downstage, a HD-cam hanging on a bungie cord manipulated by an actress to capture both her face and other actors onstage, and an iphone – capturing through face-time to an ipad that entered into the matrix – carried freely by a performer onstage to capture closeup, intimate and/or invasive shots.